Unnamed – (Robert Brenchley) This is a self-saved strain from California, about which I know nothing. Grow it and see! Yin Yang – (Ophi) Productive bushes producing tasty green beans when young or leave for yummy shelly/dried beans. 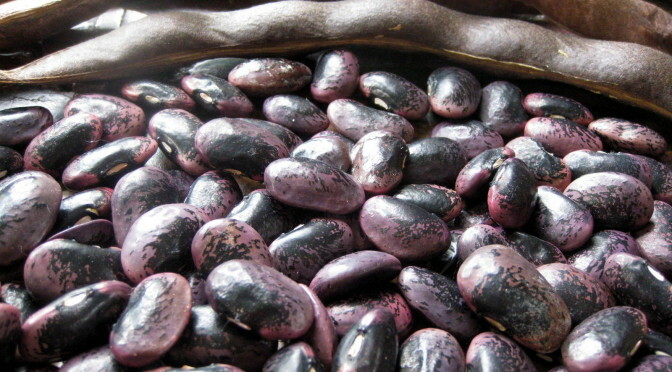 Black Magic – (Robert Brenchley) Runner bean, dark foliage, deep red flowers, large black beans. I haven’t tried saving runners before, so I hope it hasn’t hybridised! Miniature White – (Hector) Heirloom variety that produces small, thin skinned yellowy white fruit. Vines rarely exceed 3 feet and can be grown both in a glasshouse and outside. Sow at 21-25 degrees. Place in greenhouse after all risk of frosts passed. If planting outside, best planted in 12inch diameter “mounds” after frosts passed. Space 6 feet apart in all directions. Fruit should be ready for harvest 55 days after sowing. Best harvested and eaten when fruits are less than 3 inches long. They can be eaten fresh or pickled, with no need to peel. Please note that when picking older fruit, they can feel slightly spikey but this rubs off with no need to peel. 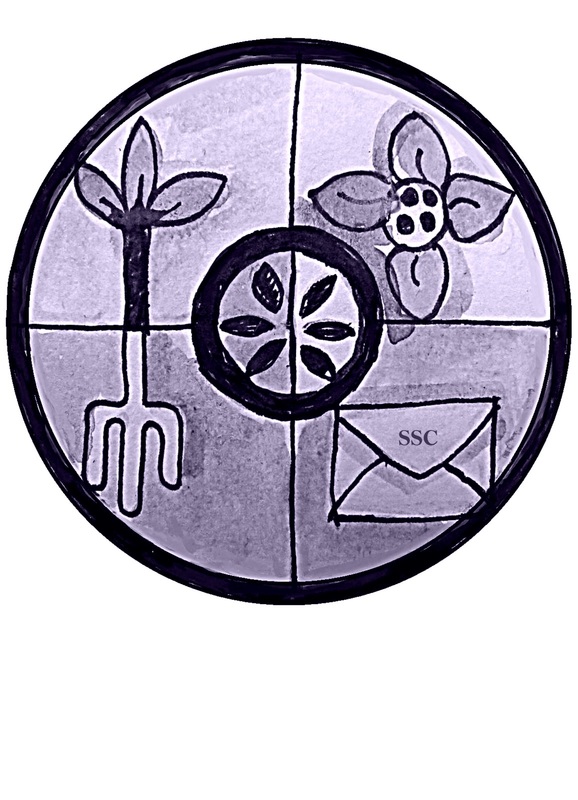 Information from Real Seeds. Yamato Three Feet – (Goodlife) Japanese ‘giant’ cucumber, ‘fruit’ often over 50cm long (20”). Suitable for both, outdoor or indoors cultivation. Delicious crispy ‘fruit’ with slightly spiny skin. None of my fruits were bitter! This one variety that is now one of my ‘must keep growing’ list. Angelica – (Robert Brenchley) Seven foot member of the carrot family. Use the young leaves and stems; it can be candied, but I haven’t tried. Biennial, self-sets merrily. The seeds probably won’t be long-lived, so plant next spring unless you’re putting them in the freezer. Hungry Gap Kale – (Robert Brenchley) Good old hardy variety. Brune d’hiver – (Galina) A small, traditional French winter lettuce, which survived well in the greenhouse. Reddish green leaves. Puts on a lot of new growth when the days are starting to get longer again. Recommended for the winter salad garden under cloches etc because of its hardiness, but just as nice grown in spring. My original seed source was Cedor seeds from France. Black Seeded Simpson – (Hector) This Heirloom variety has pale green, ruffled leaves that have a delicate flavour. It has a reputation of robustness in coping with a wide range of temperatures, including light frost. Spread is 4-5 inches. Height is 6-8 inches. 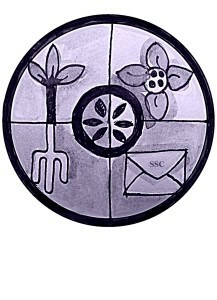 Direct sow in small batches for succession from February-September. Thin to a spacing of 4-6 inches between plants and 12-18 inches in rows. Harvest 10-12 weeks from sowing. Mammoth Melting Sugar Snow – (Goodlife) Climbing mangetout pea, making BIG pea pods with sweet taste. It is lovely as raw veg too. Skånsk Märgärt – (Goodlife) A Swedish marrowfat pea, landrace from Skåne area. White flowering variety, I’m not fully confirmed if it is just tallish variety or proper climber. Be prepared to give some ‘head room’. I found it one of best tasting varieties eating it raw straight from the plant and they were best when the pods were really full and plump. Telephone – (Robert Brenchley) Tall wrinkled pea, allegedly able to reach ten feet. More like six feet for me. First recorded in 1885. Winterkeefe Mangetout – (1066) Originally from Switzerland A tall growing vine with 2 tone purple flowers, followed by a heavy crop of tasty green pods. It is reported hardy enough to overwinter for an early crop the following spring. Alaskan Fancy – (Ophi) An early, open pollinated, bush, plum variety that can be grown outdoors in the UK. Alaskan Fancy was bred for short growing seasons with cool weather. It bears 2 oz round, red, early and juicy tomatoes. Photograph taken in July. The fruit ripened in September but I think this was due to the odd weather in August. 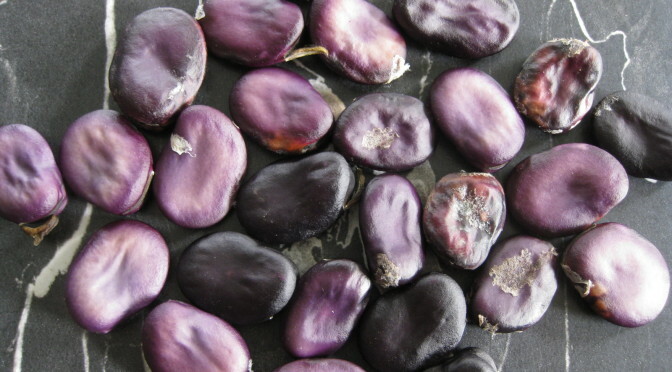 Mexican – (Goodlife) “The fruits of this variety are firstly very big and secondly they are elongated like a pimento. The plants are very productive and the fruits have very few seeds. This heirloom variety is originally from Mexico.” I found this best used as cooking/paste tomato, although it was perfectly nice eaten in sandwich too. Fruit ripens to red, cordon. OSU Blue – (1066) Bred at Oregon State University and not officially released. A cordon variety with regular leaves which notably can take on a blue-black colour from strong sunlight. Fruits ripen to red but where they have been in sunlight the skin is coloured almost black.